You have spent years building a quality and successful company. Protect your hard work, and don’t allow potential customers to walk away from your business simply because of a neglected storefront. Your customer’s first glimpse of your business is through glass. A cracked or broken glass door or window is not only a security risk, but gives the impression, to every potential customer who passes by, of an unprofessional and untrustworthy company. Every good business owner knows that maintaining the look and integrity of their glass windows and doors is essential for generating new business, and keeping existing customers coming back. But even unbroken glass may need replacing. 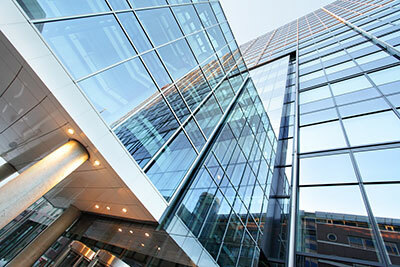 Lower quality commercial glass can be the cause of higher heating and cooling costs. Older storefronts will lead to heat loss in the winter, and the need to run air conditioning longer and colder in the summertime. Businesses which choose to replace inefficient glass windows and doors with more energy-efficient options save money on their heating and cooling bills in the future. Glass storefronts are not only practical; they can be beautiful, too. Creative business owners who want to attract attention can choose from a wide variety of custom glass storefront designs to design a one-of-a-kind appearance. Newly designed storefronts, window walls and curtain walls look impressive, especially for multi-floor properties, and are guaranteed to get a business noticed. Enjoy greater visibility and all of the benefits of increased natural light by turning the entire front of your property into a window by installing an impressive window wall. High Desert business owners have trusted Vern’s Glass to provide superior-quality glass replacement and window repairs since 1957. Vern’s Glass uses only the highest-quality commercial-grade glass from the best manufacturers in the industry; such as Cardinal Glass Products and United States Aluminum. Apple Valley business owners can depend on Vern’s Glass to install glass doors and storefronts to their exact specifications. With more than 100 years of combined glass experience, the company is the best choice for new construction, as well as handling repairs; from pivots, replacement locks, handles and door closers. Speak with a commercial glass expert at Vern’s Glass today to find out how to make your storefront the most attractive one in Victorville.